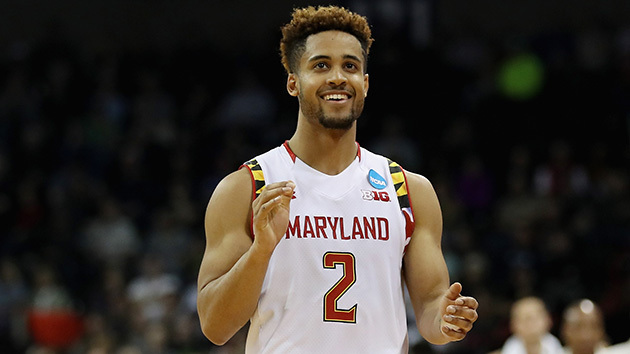 Everything you need to know about the Maryland Terrapins as they head into the Sweet 16. The Case For: It starts with Trimble, who has looked much better in Maryland’s first two NCAA tournament games than he did throughout most of February. His 24 points against Hawaii were his most in two months and his 14 free-throw attempts were his most since Dec. 8. He has still struggled with his shot (10 of 24 from the field), but the Terps’ point guard is looking a lot like his old self and that alone makes Maryland more dangerous than it was during its rough patch down the stretch. Kansas is obviously a very good team and the No. 1 overall seed for a reason, but the Jayhawks are not a bad matchup for Maryland, personnel-wise. The Terrapins have great size inside, solid guard play and five different players averaging at least 11 points. Against Hawaii, Trimble was the hero, but in the Terps’ first-round game senior forward Jake Layman tied his career-high with 27 points and Jared Nickens came off the bench to drain four threes. Maryland couldn’t buy a three against the Rainbow Warriors (1 for 18), but the likelihood of that happening in back-to-back games is not high. It also says something that it could shoot that poorly from the arc and still win by double digits. The Case Against: For a team that ranks No. 4 in the country in average height, Maryland has a serious offensive rebounding problem. Statistically, the Terps are right around the national average, but the issue has reared its ugly head on several occasions. Undersized Hawaii grabbed 16 offensive boards in its loss to the Terps, while South Dakota State grabbed 11 just two days prior. To beat the Jayhawks, Maryland will need to limit Kansas’s second-chance opportunities, yet it remains to be seen if the Terrapins are willing to. They managed to hold their own against an elite rebounding squad in Michigan State in the Big Ten semifinal, yet let the Rainbow Warriors have their way on the offensive boards a week later. Unlike Hawaii, Kansas is an excellent three-point shooting team, which means the Jayhawks will very likely make Maryland pay if they get extra opportunities. Extra opportunities could also come via turnovers, where the Terps have often struggled, ranking 242nd in the nation. In short, Maryland has the talent to seriously challenge if not beat Kansas, but it will take the kind of focus on offense and defense that it has rarely put together for 40 minutes this season to do so. SI Prediction: Lose to Kansas in the Sweet 16.